One evening as I was sitting on the couch my husband casually said. hey would you like to go to Abu Dhabi in a couple weeks. Ahhh really? Umm Sure. I mean he has spent the past 4 years on projects in the UAE and so of course I want to see this country I have heard so much about. 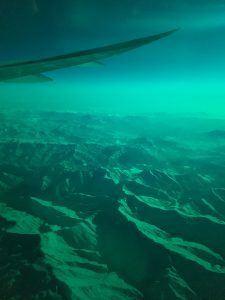 I really wasn’t sure what to expect and I will say as we were flying over Baghdad I was a little concerned about this trip we were on. Once we landed and walked through customs, had this fancy camera that takes picture or screen your eyeball, we were both welcomed. But before we could exit we had to go through one more screening of all our luggage. Once we exited and grabbed a taxi to our hotel, it was about 10-15 minute drive. 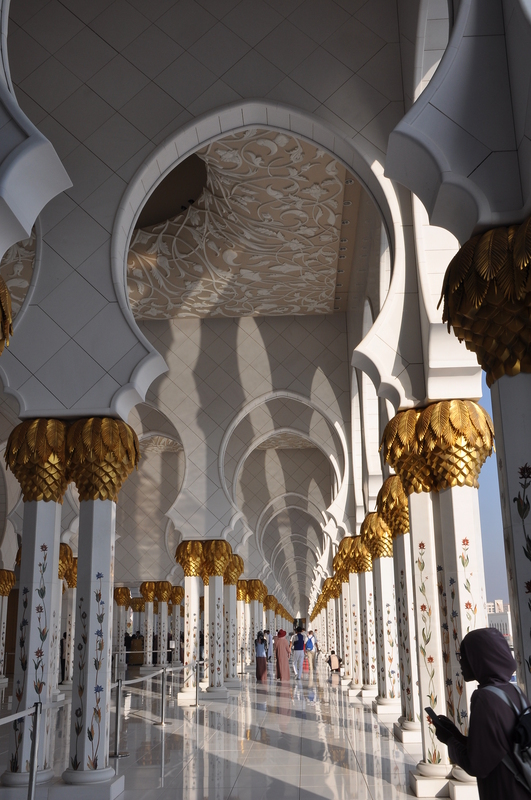 We pulled up and our doors were open for us, all our luggage was carried, doors held open for us. I felt like royalty and this how we were treated on a daily basis. 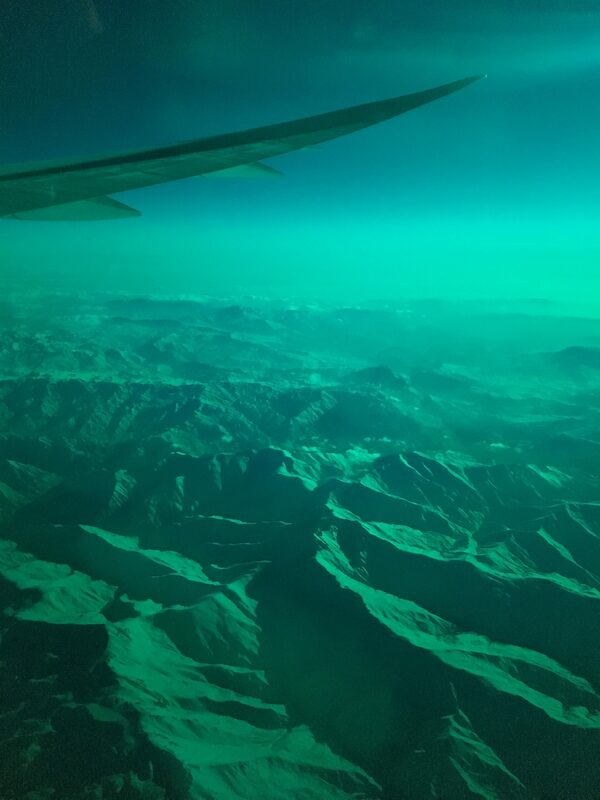 Middle East has never been on my Bucket List but I am so blessed to have experienced this beautiful country. Not at all what I had pictured it would be like. As a American when we hear Middle East it’s not exactly a vacation destination. BUT it is that and more!! I felt like I was in a big city such as Los Angeles. 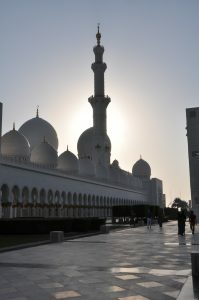 Only difference is here in Abu Dhabi we were treated amazing by everyone we encountered! So much respect is shown here. It’s their vibe and it’s an awesome experience. Finally I get to ride a camel!! 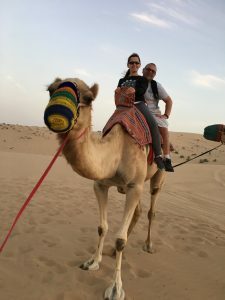 I did always want to ride a camel and this experience was awesome! 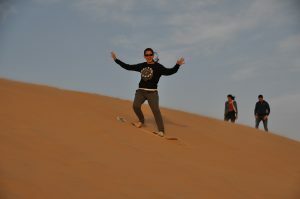 Dune Bashing through the Arabic desert!! Yes Please! I’d do that over and over! Such a ride! Dune Surfing…I tried and had a blast doing it! Check out this Company Those in this company were so kind! What a great experience! 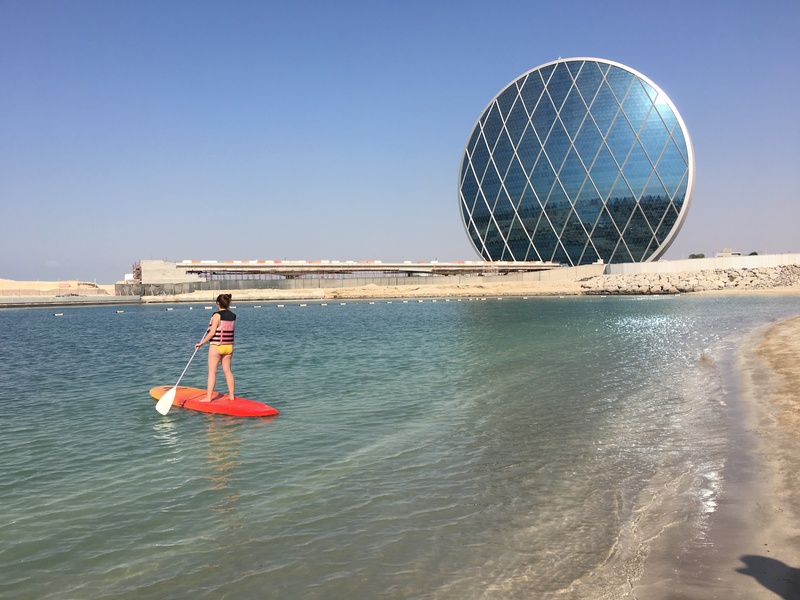 Paddle Boarding on the Persian Gulf… Never had I thought I’d have these chances and great experiences! And look at the skyscraper in my view! 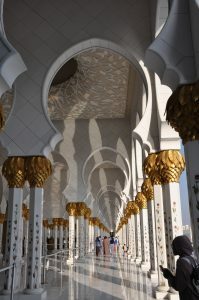 It was an awesome learning experience, visiting a Muslim country and having a peek into their world will be unforgettable. It was a Grand place, a Grand experience and the people there were out of this world!! We were treated like royalty every where we went. 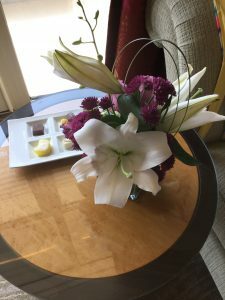 The hotel staff was amazing and would bring us vases of flowers and they would on a daily basis leave fresh lilies on our bed and in the bathroom. They would bring small plates of sweets and they knew we were water drinkers and would line our cabinet with water! We would have fun animals made of towels on our bed upon our return! 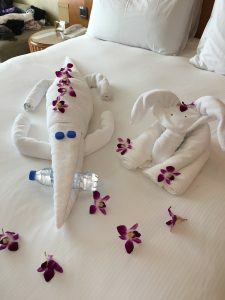 You can check out Al Raha Beach Hotel here. The modesty that this country lives was a nice setting to be in. I had no issues covering my shoulders and not wearing shorts in public areas. It was really nice not having lunch in restaurants and having someones crack right in front of you. No saggy pants…conservative dressing is not all bad. I enjoyed hearing the prayers throughout the day. I didn’t understand it but someone translated what the prayers were about.Just as we pray… Be good, do good and spread good. I loved that when we flew Etihad to Abu Dhabi that they have a prayer prior to take off. That was awesome!! Who doesn’t want a prayer prior to flying. The cuisine is from all parts of this world! My husband and I love great food and we had no shortage of that! The cuisine here is amazing. So many different cultures are here and so we enjoyed German, Italian, Arabic, Lebanese and more! 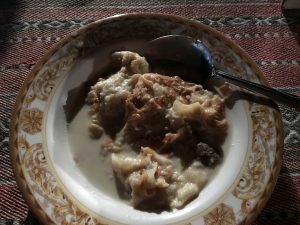 Arabic Dessert This dessert was out of this world…full of flavors of cinnamon, cardamom. Served hot and yes I had seconds!! There is a small glimpse into our time in Abu Dhabi!! If you’re looking for super soft and absorbent bibs check out these at Amazon. 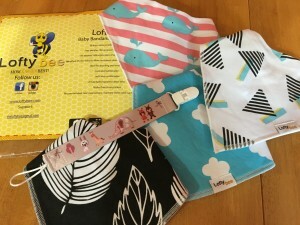 They are Loftybee Baby Bandana Bibs. They are Unisex…designs are great. This also comes with a free pacifier clip. These have been great for my teething grandson. I received this product at a discount or at no charge in exchange for my honest opinion.